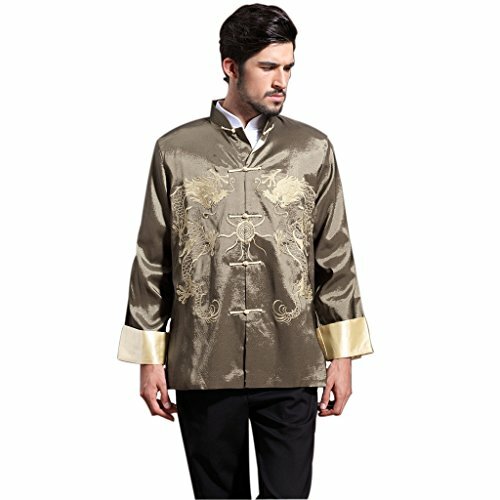 Master J's pure traditional Chinese style Kung Fu shirt / Tang jacket is your perfect outfit for practicing Kung Fu, stage performance and daily fashion. The fine material and workmanship, together with vintage retro design, is ideal for any people. This shirt is DOUBLE-SIDED. You can simply turn it inside out to change to another color! The inside is complete the same material and quality. Material: Cotten blend / flax. Feels and looks rougher than pure cotton but completely safe and comfortable as well! Size S: Shoulder width 16", Chest Circ 41", Waist Circ 40", Shirt Length 28.5", Sleeve Length 24.5"
Size M: Shoulder width 16.5", Chest Circ 42", Waist Circ 41", Shirt Length 29", Sleeve Length 25"
Size L: Shoulder width 17", Chaest Circ 43.5", Waist Circ 42.5", Shirt Length 29.5", Sleeve Length 25.5"
Size XL: Shoulder width 17.5", Chest Circ 45", Waist Circ 44", Shirt Length 30", Sleeve Length 26"
Size XXL: Shoulder width 18", Chest Circ 46.5", Waist Circ 45.5", Shirt Length 30.5", Sleeve Length 26.5"
Size XXXL: Shoulder width 18.5", Chest Circ 48", Waist Circ 47", Shirt Length 31", Sleeve Length 27"
Note: Please make sure to CHECK SIZE TABLE carefully before buying! Make sure your body's chest circ is at least 3 inches smaller than the shirt's chest circ listed above. Thank you for cooperation! Traditional vintage Chinese style Tang suit / Kung Fu shirt. Fine material and top class workmanship. Beautiful Chinese silk style. Pattern: Double Dragons Playing with Pearl. Exquisite embroidery. Shining silk material. Please CHECK SIZE TABLE in description first! Don't look at the generic size table! Don't buy if size doesn't fit. Thanks! View More In Traditional & Cultural Wear. If you have any questions about this product by Master J, contact us by completing and submitting the form below. If you are looking for a specif part number, please include it with your message.